Jennifer Reeser’s Indigenous is, by turns, a celebration of her Native American heritage and a lamentation decrying the social injustice and tragedies endured. Through Reeser’s sublime craft and formal prowess, ancestral memories and spirits—both the immediate and the historical—are visited with chants, prayers, or rituals: be it imagined, culled, or translated in the backdrop of history, myth, and lore. Reeser also immerses us in her mixed-race heritage, in the “bloody war/ Inside of me, between the Red and White.” This collection is as uniquely inspirational and thought-provoking as it is fun—a collection not to be missed. The beauty of this collection of poems is the way it uses every device capable of reaching the reader. 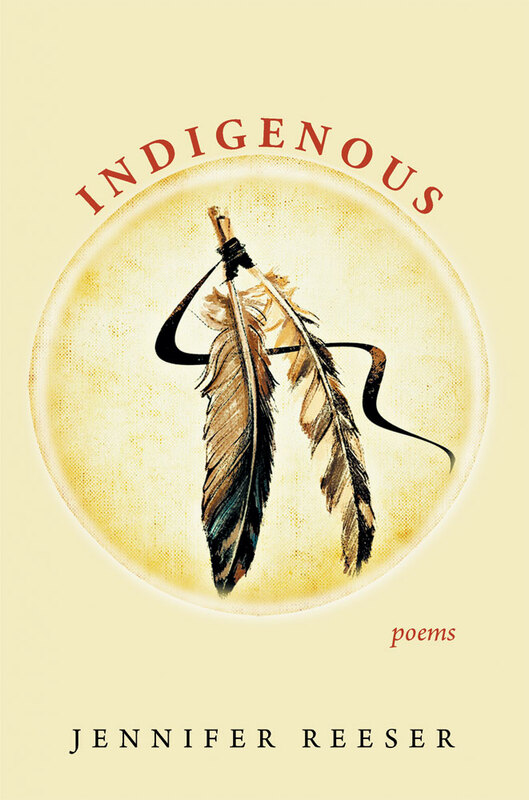 These poems go behind the familiar: Wounded Knee, the Trail of Tears, figures such as Sequoyah and Chief Joseph; past the artifacts, legends, and folkways encountered through reading and travels across America, to the intimate details of a specific family and their lives and world seen from the inside. They give, as our literature seldom does, moral weight to the real and living representatives of those nations, rather than to the romanticized or demonized figures imagined by film. 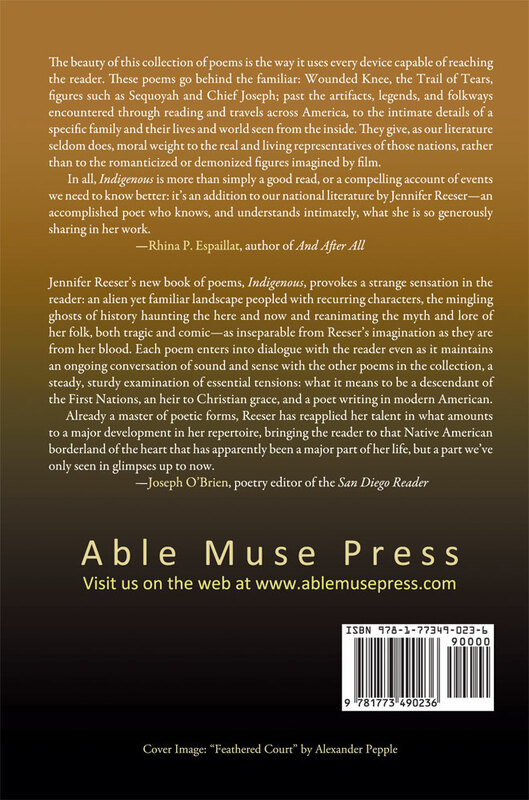 In all, Indigenous is more than simply a good read, or a compelling account of events we need to know better: it’s an addition to our national literature by Jennifer Reeser—an accomplished poet who knows, and understands intimately, what she is so generously sharing in her work. Jennifer Reeser’s new book of poems, Indigenous, provokes a strange sensation in the reader: an alien yet familiar landscape peopled with recurring characters, the mingling ghosts of history haunting the here and now and reanimating the myth and lore of her folk, both tragic and comic—as inseparable from Reeser’s imagination as they are from her blood. Each poem enters into dialogue with the reader even as it maintains an ongoing conversation of sound and sense with the other poems in the collection, a steady, sturdy examination of essential tensions: what it means to be a descendant of the First Nations, an heir to Christian grace, and a poet writing in modern American. Already a master of poetic forms, Reeser has reapplied her talent in what amounts to a major development in her repertoire, bringing the reader to that Native American borderland of the heart that has apparently been a major part of her life, but a part we’ve only seen in glimpses up to now. Jennifer Reeser is the author of five collections of poetry. Her first, An Alabaster Flask, was the winner of the Word Press First Book Prize. X. J. Kennedy wrote that her debut “ought to have been a candidate for a Pulitzer.” Her third, Sonnets from the Dark Lady and Other Poems, was a finalist for the Donald Justice Prize. Her fourth, The Lalaurie Horror,debuted as an Amazon bestseller in the category of Epic Poetry. Reeser’s poems, reviews, and translations of Russian, French, along with the Cherokee and various Native American Indian languages, have appeared in POETRY, Rattle,the Hudson Review, Recours au Poème, LIGHT Quarterly, the Formalist,the Dark Horse, SALT, Able Muse, and elsewhere. Her poetry has been anthologized in Random House London’s Everyman’s Library Series, in Longman’s Introduction to Poetry, in the Hudson Review’s historic Poets Translate Poets, and in others. A biracial writer of Anglo-Celtic and Native American Indian ancestry, Reeser was born in Louisiana. She studied English at McNeese State University in Lake Charles, Louisiana, and also in Tulsa, Oklahoma, her former home. Reeser is the former assistant editor of Iambs & Trochees, as well as a former moderator, manuscript consultant, and mentor with the West Chester Poetry Conference. Reeser’s translations of the Russian poet Anna Akhmatova are approved by Akhmatova’s living heir, and authorized by her agents in Moscow. Reeser received her first writing award from the Pulitzer Prize winner, Robert Olen Butler, while in high school. She has received the Poets Respond Prize from Rattle, the Innovative Form Award from the World Order of Narrative and Formalist Poets, as well as the Lyric Memorial Prize and the New England Prize. Reeser’s work has been nominated seven times for the Pushcart Prize, and numerous times for the Best of the Net anthology; and her work has been set to music by the classical/art song composer, Lori Laitman, for her tribute to writer Edna St. Vincent Millay. Reeser’s poems have been translated into Urdu, Hindi, Persian, and Czech.